These aren't ideal viewing conditions but what do you think of this granite-like fabric as sashing for my funny lotteria card blocks? I sort of like it but I don't trust myself! Well, since you asked I will be honest, I don't care for it. I think something more colorful in the colors in the blocks would look nicer. Something red, blue, yellow or green. Love the blocks too! Thanks. My initial thought was going with something dark that would pick up a color in the blocks. I just came across this and wondered....I appreciate your honesty! Last edited by Sarah in Brooklyn; 06-21-2013 at 09:41 AM. Look great! If it looks good to you then it is good! I took classes a few years back from Freddy Moran. She is all about color and not do much about quilting. One thing she taught that I have done many times, and probably more than I should have, is to use something that gives your a rest between colorful blocks. In her quilts I noticed she used lots of black and white. I have used lots of black and white polka dots to break up the colors. Last year I made a Dios deLos Muertos quilt. Very colorful fabric broken up with the polka dots. Wish I had kept a picture of it. I am not familiar with that line and if they have different colorways. I think it tones down your nice card blocks. I think I agree with trying to find something either brighter or very dark neutral. I like the swirly granite fabric! It picks up the blue and white well and anything brighter I think would over shadow the blocks. It's a good idea to use something restful to balance out the color. I'm going to play around with that. I think I would use a green the color in one of the blocks. Just my opinion. Your quilt do as you like. I agree with Tartan. This fabric seems perfect as the background fabric. The fabric looks like a totally different style to me. The print in the blocks is very distinct. The marble-y fabric is more subtle. The fabric you have for the sashing is fine... however, I'd add that blue/turquoise color too. Maybe "frame" your squares in that color, then add the granite looking fabric. Oh, I'm terrible at this. I'm about to post a similar question! But here's my 2¢: The blocks have a modern, wonky feel to them. The colors are clear and nearly primary, whereas the marble fabric is muddy and indistinct. It doesn't play well with the blue geometric fabric. If it were me, I'd keep looking. That fabric will change the whole feel of the quilt. Having said that, maybe that's what you're after! If so, I'll just take my pins and go home. This is what I think. Match the "feel" of the blocks. Yeah, I'm leaning toward something more geometric or another batik. I love all these responses. It really makes me think! I think you're close ... the colors are just a smidge off, and the organic feel of the mottle doens't play well with the abstract art work. Oooh ... I think this one would be awesome with your blocks. Perhaps a slightly larger white border, then this print with a wonky mitered corner. Last edited by DogHouseMom; 06-21-2013 at 12:36 PM. Those are amazing! Thanks so much! Personally, I like it - wouldn't like a real busy print between your blocks. Love your blocks but agree that the fabric proposed for the sashing is distracting. (/QUOTE) The blocks have a modern, wonky feel to them. The colors are clear and nearly primary, whereas the marble fabric is muddy and indistinct. It doesn't play well with the blue geometric fabric. If it were me, I'd keep looking. That fabric will change the whole feel of the quilt. Having said that, maybe that's what you're after! If so, I'll just take my pins and go home. [/QUOTE] I agree. To me, it's not the right fabric. i'm with tezell... the two styles are just too different for my taste. Like the material fine - just not a lot of it. Putting a medium band width around the blocks would work without overwhelming them. Just my thoughts. I'm not crazy about the granite. Maybe use it for the backside of the quilt. Sorry, but I think I would search for another fabric for the sashing. The colorful blocks are from a different "family" than the granite fabric. I love the granite fabric, and I love the blocks, but not together. I hope you will show us the finished product, because it will surely be a winner! Ok I'm going to go against the flow here and say I love the fabric as sashing. 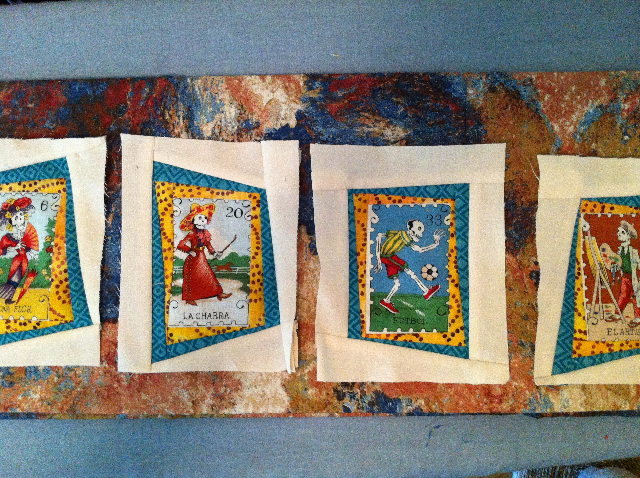 I wouldn't have it very wide - no more than 2"- but I think it picks up the colors and still makes you look at the cards.